The first series of Postman Pat was broadcast in the UK in 1981. The 13 original stop-motion episodes proved popular and it was not long before the first Postman Pat merchandise was released. American toy company ERTL, which specializes in die-cast farm toys, secured the first license to manufacture Postman Pat toys in the early 1980’s. ERTL released a range of carded die-cast Postman Pat vehicles. 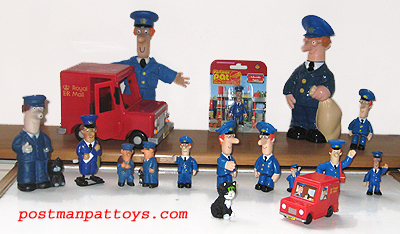 The first Postman Pat figure was a plastic wind up version by ERTL. The second 13 episode series of Postman Pat was broadcast in 1996, also by Woodland Animations for the BBC. At this time Corgi released their range of die-cast Postman Pat toys. These were broadly similar to the ERTL range with carded vehicle and static figure twinpacks. From 2004 Postman Pat had a new production company Cosgrove Hall. Entertainment Rights were licensed to manufacture Postman Pat toys till around 2008 when Character Options were awarded the license. ER made a larger plastic Postman Pat van with friction drive and a semi-articulated figure of Postman Pat. Naturally, you could also get the Greendale Rocket as well as Ted Glen’s Truck. More recently Postman Pat lost its sponsorship from Royal Mail and Pat became an employee of the Special Delivery Service, or SDS. This heralded a brand new range of electronic toys from new Postman Pat master licensee Character Options. Character released their first new Postman Pat branded toys in 2009. The Character toys include the first Postman Pat playsets and the first electronic Postman Pat vehicles, including the new SDS motorbike and helicopter.